A 2.25-meter long cable connects the display with the weighing base. Advantage: the display can be set up separately from the base and read from its position on the wall or desk. 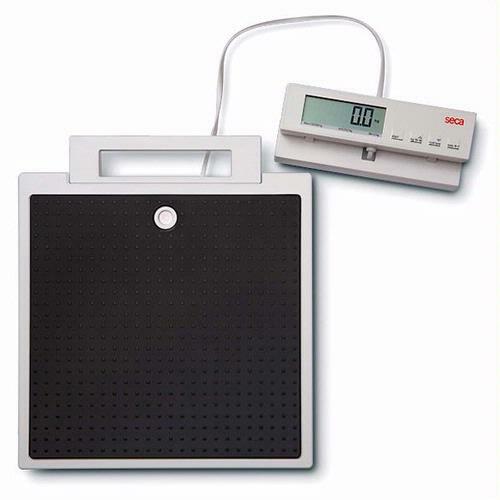 Additional convenience is supplied by the many extra weighing functions: BMI for nutritional conditions, HOLD to keep measurements displayed and TARE for weighing small children held in an adult‘s arms. It is suitable for stationary or mobile use, thanks to its handle, compact size, low weight and a leveling base for set-up on all types of surfaces. Separate display and operating element with infinitely adjustable tilt angle for convenient use. BMI function to determine nutritional status. Read the display while at your desk. The seca 869 makes your work easy. Simply place the display on your desk and the scale in front of it. Connect the two with the 2.25-meter cable and you‘re ready to work. It‘s also easy to read the results since the tilt angle of the display is infinitely adjustable. Stability even on problematic surfaces. An especially large leveling base gives the seca 869 great stability. The display and operating element is similarly equipped with a stable rubber base and with an easy-to-use self-explanatory keyboard. Storage is also effortless, thanks to its compact dimensions and light weight. Measuring with all essential functions. The carrying case for the Seca 869, Seca 876, Seca 882, or Seca 884 floor scales. This durable nylon case is roomy and spacious yet weighs only 2 lbs. Comes complete with comfortable shoulder strap.